Windsor Musings: Pride and Prejudice is 200! Pride and Prejudice is 200! The 200th anniversary of the publication of Pride and Prejudice was this week! This is easily one of my all-time favorite books, and it introduced me to Jane Austen, to British literature, and to classical literature in general, and for that reason, it holds a very special place in my heart. It is unbelievably well-written, and has stood the test of time- so many of the ideas from the book still seem relevant today. If for whatever reason, you've never read the book, you absolutely must. Additionally, so many of the screen versions of Pride and Prejudice have been incredible as well. From the 1995 BBC version with Colin Firth to the 2005 big-screen version with Kiera Knightley and Matthew MacFadyen and even to The Lizzie Bennet Diaries on YouTube (Have you been watching? It's so addictive! ), the book has been told and retold so well. Just writing this post makes me want to sit down with the 2005 version and a cup of hot tea. Maybe this weekend! 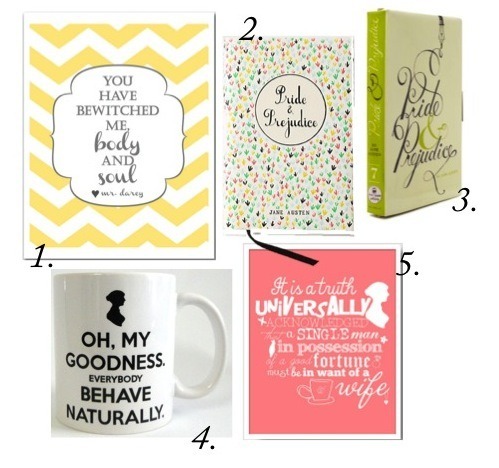 Here are a few prints, books, clutches, and even a mug that I love.